One of the real natural wonders in the Northern Territory is Litchfield National Park. Located just an easy two hour drive south of Darwin, this National Park is a must-see, and is loved and enjoyed by both locals and tourists, particularly for its refreshingly natural swimming pools. The environment within Litchfield is so unique, with lush monsoon forest, sandstone plateau, savanna woodland, and incredibly diverse and rare wildlife. The landscape is harsh and the climate unrelenting - shaped by millions of year of weathering and erosion it is either baking hot, bucketing down with rain, or both. You will certainly not regret an opportunity to experience this truly special place. Many of the roads within the Litchfield National Park can be inaccessible between November and April due to the tropical wet season. The dry season, between June and August is the peak period for visitors. The generous rains of the wet season having soaked their way down through the pores of sandstone rock along the tabletop plateau are slowly released through natural springs over the course of the long dry spell - maintaining many of the water holes found within this park. You really need to allow 2-3 days to fully experience this park. One option is to stay at one of the park's camping sites. At the time of printing, the fees per night were $6.60 per adult, $3.30 per child or $15.40 for a family of 2 adults and up to 4 children. 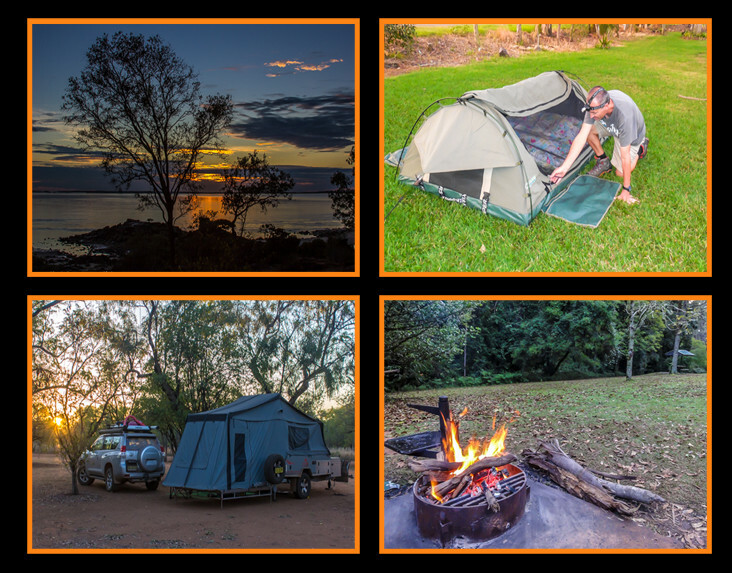 Another option is to stay at one of several powered sites and parks within an hours drive of Litchfield at places like Batchelor, Coomalie and Berry Springs. Prices can range between $20 and $40 per night for a powered site. We detail some of the park's highlights below, along with a few tips for making the most of your time here. One of the largest and most popular attractions in the park. This large water hole is fed by two waterfalls and is a short walk (less than 300 metres) from the car park and campground. Wangi Falls is also the spot for information sessions and ranger talks, which are fantastic if you can make it, plus they have a café for meals, cold drinks or ice-cream on a hot day (in other words – every day up here!). This is a major stop for tourist groups, but with such a large pool, there is ample room to enjoy a swim. Like many water courses in Litchfield National Park, this permanent pool is a haven for aquatic life. Keep your eye out for fish below the water and turtles sunning themselves near the shores. There is a beautiful loop walk that will take you up and around the falls. This is another popular waterfall. The swimming hole is much smaller than Wangi Falls and it can get quite crowded during the day. Like Wangi Falls, you can avoid the crowds by visiting early in the morning or later in the afternoon. There is a lookout and viewing platform that allow you to take in a panoramic view of the falls and surrounding area. To reach the falls you need to descend down over 100 steps to the swimming area at the base of the falls. You can also access the falls along the Shady Creek Walk. It is an easy one way 1 km walk to the falls through both dry savanna woodland and moist monsoon forest. It is a beautiful walk and offers a temporary shady retreat from the Top End sun. This is a real favourite with many visitors and offers a rather different experience in that there are a series of much smaller waterfalls and rapids that cascade into several pools over an area of approximately 150 metres. Even when it is crowded, you’re likely to find a spot to yourself for a bit. With so many different watery fun experiences to choose from, including the spa, plunge pool, shallow pools for the kids, or a tropical rainforest feel in the lower pools, you’ll just fall in love with this spot! The landscape is harsh and the climate unrelenting....it is either baking hot, bucketing down with rain, or both. The Tolmer Creek Walk that takes you out to this lookout is simply beautiful. The track is a 45 minute return moderate walk that meanders along the rocky Tabletop Plateau through woodlands and cycads before arriving at a spectacular view of the falls. This location has no swimming opportunities, but you can capture some great photos of the gorge and surrounding lowlands. This picturesque gorge is the result of weathering and erosion of the Tabletop Plateau's sandstone and quartzite rocks allowing the creation of beautiful water features such as Tolmer Falls. Access to the gorge has been closed to the public for more than 20 years to protect the habitat of the fragile Orange Leaf -nosed and Ghost Bats that inhabit this area. The fascinating magnetic termite mounds are a feature of the park's black soil floodplains. You will find a viewing area along the main entry point to the park - Litchfield Park Road. Termites are small white ants and the ones found in Litchfield are unique. The magnetic termite build towers that keep them above the water table in the wet season and allow space for food storage. The incredible elongated mounds align on a north-south axis so that one side will always be in shade. This ensures that there is always an area within the mound with the right conditions during the heat of the day. This track is designated as 4WD only. The 10.5km unsealed track features some corrugations, wash outs and sand. With a little bit of imagination, a visit to this must see natural wonder will have you feeling like you’re surrounded by the weathered ruins of an ancient city. It is so beautiful, see if you can spot the monolithic leader statue, the animal monuments perched high on top of the ‘buildings’, and other imaginary ruins of a city that could have been lost to history, you’ll be transported to a time that never even was! This was our favourite waterfall in the park. It is one of the most secluded, and you can probably find yourself here with few or no other people around if you’re lucky! The large pool is lovely and refreshing. The track out here is 4WD only, and there are a few creek crossings, but it is well worth the trip if you have the right vehicle. From the carpark it is a 1.8km walk one way through woodlands to the falls. A pool noodle here is handy as it is at least a 25 metre swim to the base of the falls. In the dry season the water patiently traverses its way down the semi steep and uneven rock face creating a soothing shower. There are a few natural rock ledges perfectly positioned underneath this waterfall that will allow you to sit and relax while the water gently massages your shoulders. This relic of early Australian pioneering life in the Australian outback can be found along the Reynolds River Track leading out to the Tjaynera Falls. The track is 4WD only. The homestead ruins will transport you back to a time before motor vehicles and modern communication devices. The rusty corrugated iron roof provided welcome relief as the morning sun began to bake the dirt and dust. We viewed some interesting displays, remnants of an old tin mine, and wandered through a photo album that shares the story of the Sargent family who settled there in the early 20th century. It was humbling to read about the trials and tough conditions faced by Australia's pioneers. In the dry season, it really starts to heat up around 11am. The hottest part of the day is usually between 11am and 3pm and this is when the waterfalls and natural rock pools are at their most crowded. Plan your visits in the early morning and late afternoon to beat the midday crowds! As well as enjoying a refreshing swim there are numerous walks that will allow you to take in the stunning scenery in this park. It is best to do any walks in the morning when the air temperature is more comfortable. The terrain in and around the natural pools and waterfalls is rocky and sometimes slippery. A pair of aqua shoes are extremely useful and can make traversing the pools much safer and easier. Some of the larger pools such as Wangi and Florence Falls have deep sections. Sometimes swimming out to the waterfalls can be a 25 metre swim or further. A noodle is handy if you have small kids, you are not a strong swimmer or you just want to relax and float in the water. Litchfield National Park contains important natural habitats that are unique and valuable, particularly to the Top End of Australia. The area is also spiritually significant to the Koongurrukun, Mak Mak Marranunggu, Weret and Warray Aborignial people. Respecting these assets and the enjoyment of others now and into the future is easy. By sticking to dedicated tracks and paths and taking any rubbish away with you we can all do our bit to protect the park's plants, animals and cultural heritage.